The largest-ever experiment in space has reported the collection of some 18 billion “cosmic ray” events that may help unravel the Universe’s mysteries. Run from a centre at Cern, the Alpha Magnetic Spectrometer (AMS) aims to spot dark matter and exotic antimatter. At the heart of the seven-tonne, $2bn machine is a giant, specially designed magnet which bends the paths of extraordinarily high-energy charged particles called cosmic rays onto a series of detectors, giving hints of what the particles are. A series of ever-larger particle accelerators built here on Earth aim to drive particles to ever-higher energies, smashing them into one another to simulate the same processes that create them elsewhere in the cosmos. But no Earth-bound experiment can match nature’s power as a particle accelerator – and Earth’s atmosphere absorbs incoming cosmic rays – so the AMS will catch some of these high-energy particles “from the source”, as a kind of complement to the likes of the Large Hadron Collider. This Sunday (July 1, 2012), three members of the International Space Station crew will return to Earth on board a Kazakhstan-bound Soyuz craft, after over six months in orbit. Don Pettit and Andre Kuipers, two of the returning astronauts, and Joe Acaba, who arrived at the station in May, discuss life on board ISS, the visit of the Dragon capsule, and current activities in space. FLORA LICHTMAN: Just another day at SCIENCE FRIDAY, calling space. Station, this is National Public Radio. How do you hear me? DON PETTIT: NPR, we hear you loud and clear. LICHTMAN: Don Pettit, walk us through how you’ll get back to our planet this weekend. PETTIT: We will get in our Soyuz spacecraft and under the command of Oleg Kononenko, and Andre Kuipers will be flight engineer one or board engineer one, and I’m board engineer two. And we work together to get this spacecraft back home, starting off with undocking. We start off, we get inside, the close the hatch, we have to do a leak check, make sure the hatches don’t leak. And then we strap in and undock, and then we do a de-orbit burn. And then as we hit the atmosphere, the spacecraft separates so that only the descent module comes through the atmosphere in one piece. And then our parachute comes out, and we go thump, roll, roll on the steppes of Kazakhstan. How close does an object have to be to earth to be pulled by gravity? Pulled from Quora, here is one of the best, and most popular, answers to a question. Written by Mark Eichenlaub, a graduate student in physics. This question doesn’t have a direct answer because, for lack of a less-direct way of saying it, that’s not the way it works. If there were no atmosphere, you could have the ISS be just above the surface of the Earth, high enough only to clear the mountains. On the other hand, you could have something as far out as the moon, and if it weren’t going fast enough and in the right direction, it would still fall back down. The ISS doesn’t stay up because of how high it is, but because of a combination of that and how fast it’s going. One of the most difficult things to learn about physics is the concept of force. A force in a given direction does not make things go straight in that direction. Instead, it influences the motion to be a bit more in the direction of the force than it was before. For example, if you roll a bowling ball straight down a lane, then run up beside it and kick it towards the gutter, you apply a force towards the gutter, but the ball doesn’t go straight into the gutter. Instead it keeps going down the lane, but picks up a little bit of diagonal motion as well. The the force is straight down, but that force doesn’t stop the rock from moving horizontally. If you throw the rock horizontally harder, it goes further, and falls at a shallower angle. The force on it is the same, but the original velocity was much bigger and so the deflection is less. Now imagine throwing the rock so hard it travels one kilometer horizontally before it hits the ground. If you do that, something slightly new happens. The rock still falls, but it has to fall more than just 100m before it hits the ground. The reason is that the Earth is curved, and so as the rock traveled out that kilometer, the Earth was actually curving away underneath of it. In one kilometer, it turns out the Earth curves away by about 10 centimeters – a small difference, but a real one. As you throw the rock even harder than that, the curving away of the Earth underneath becomes more significant. If you could throw the rock 10 kilometers, the Earth would now curve away by 10 meters, and for a 100 km throw the Earth curves away by an entire kilometer. Now the stone has to fall a very long way down compared to the 100m cliff it was dropped from. Continue reading How close does an object have to be to earth to be pulled by gravity? Posted on April 18, 2012 Author robotchampionCategories defaultTags earth, force, gravity, international space station, iss, moon, orbit, physics, quora, Science, space, sun, travelLeave a comment on How close does an object have to be to earth to be pulled by gravity? Multitudinous stars but what is really awesome are the shots or Earth. The atmosphere glows faintly while the surface is lined with an array of lights, lightning storms, and mountains. Makes me feel like we are an advanced civilization, even a planet in a Star Wars movie (that’s Coruscant for you geeks). Timelapse videos depicting the stars from low earth orbit, as viewed from the International Space Station. Images edited using Adobe Lightroom with some cropping to make the stars the focal point of each shot, and with manipulation of the contrast to bring out the stars a bit more. The video plays best if you let it load a bit first. It’s fun to watch the birds and pigs bounce around the International Space Station, plus check out the really cool game footage at the very end. NASA said hackers broke into its computer systems 13 times last year, stealing employee credentials and gaining access to mission-critical projects in breaches that could compromise U.S. national security. 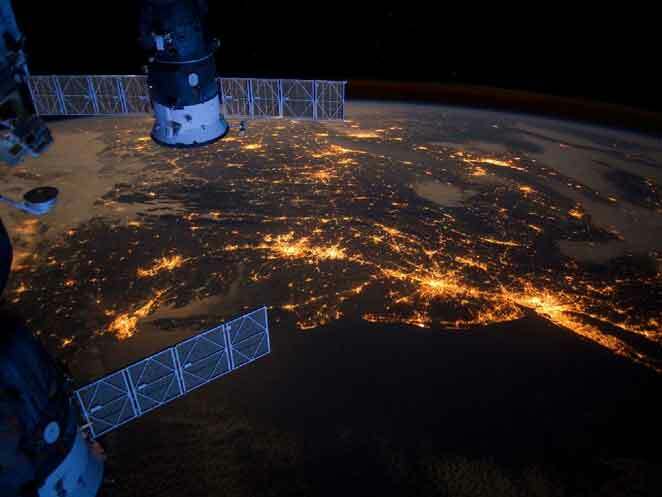 The National Aeronautics and Space Administration spends only $58 million of its $1.5 billion annual IT budget on cyber security, Paul Martin, the agency’s inspector general, told a Congressional panel on NASA security earlier this week. He said the agency discovered in November that hackers working through a Chinese-based IP address broke into the network of NASA’s Jet Propulsion Laboratory. He said they gained full system access, which allowed them to modify, copy, or delete sensitive files. Unencrypted notebook computers that have been lost or stolen include ones containing codes for controlling the International Space Station as well as sensitive data on NASA’s Constellation and Orion programs and Social Security numbers, Martin said. Feb 6, 2012 — One of the Expedition 30 crew members aboard the International Space Station took this nighttime photograph of much of the eastern (Atlantic) coast of the United States. Large metropolitan areas and other easily recognizable sites from the Virginia/Maryland/Washington, D.C. area spanning almost to Rhode Island are visible in the scene. Boston is just out of frame at right. Long Island and the Greater Metropolitan area of New York City are visible in the lower right quadrant. Large cities in Pennsylvania (Philadelphia and Pittsburgh) are near center. Parts of two Russian vehicles parked at the orbital outpost are seen in left foreground.